When local children are placed into St. Joseph Orphanage’s Residential Treatment Program after being removed from crisis, they often arrive with little more than the clothes on their backs. 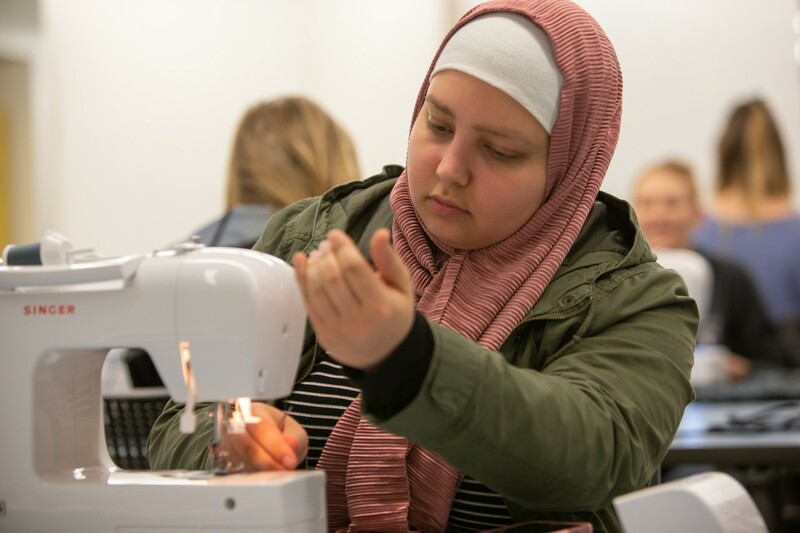 But thanks to a service project hosted at the University of Cincinnati’s College of Design, Architecture, Art, and Planning, many of these children will receive a handmade comfort item that’s all their own. 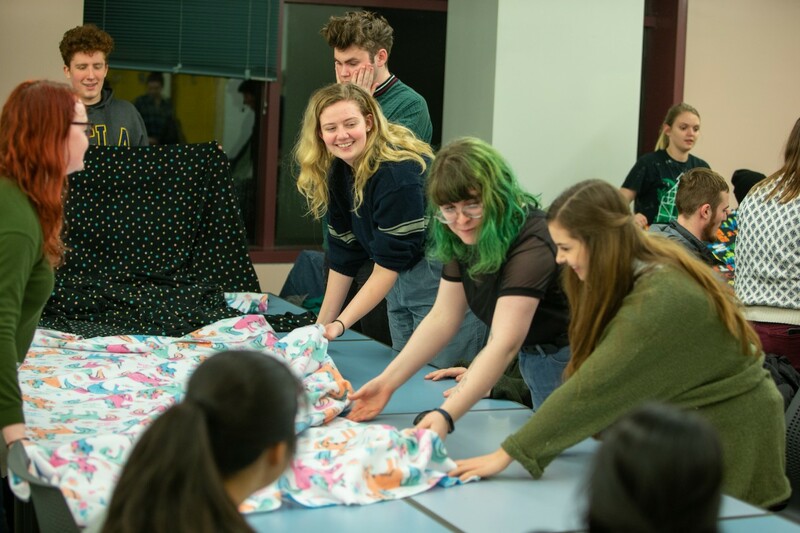 Nearly 100 students packed into a DAAP studio Thursday to learn more about St. Joseph and work together to create fleece hats and blankets for local children in need. 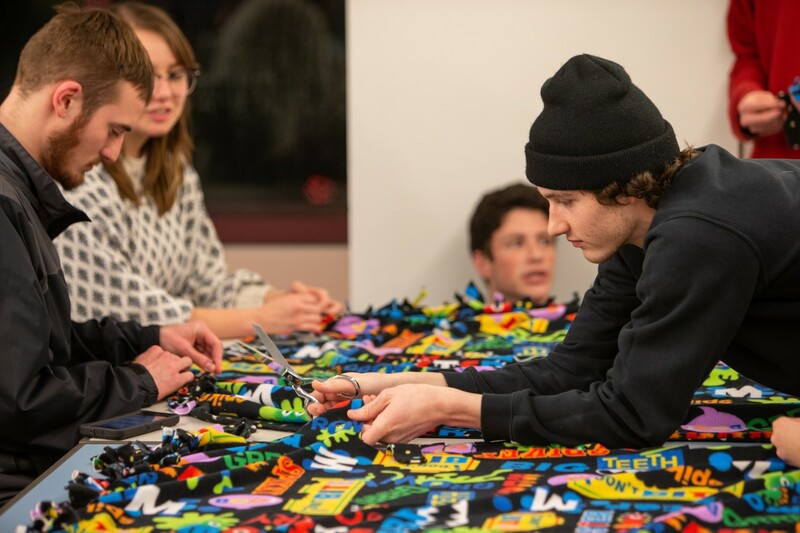 The service project coincided with a recruitment event where students could meet and interview with corporate partners. Making an urban impact is a key goal of UC’s strategic direction, Next Lives Here. 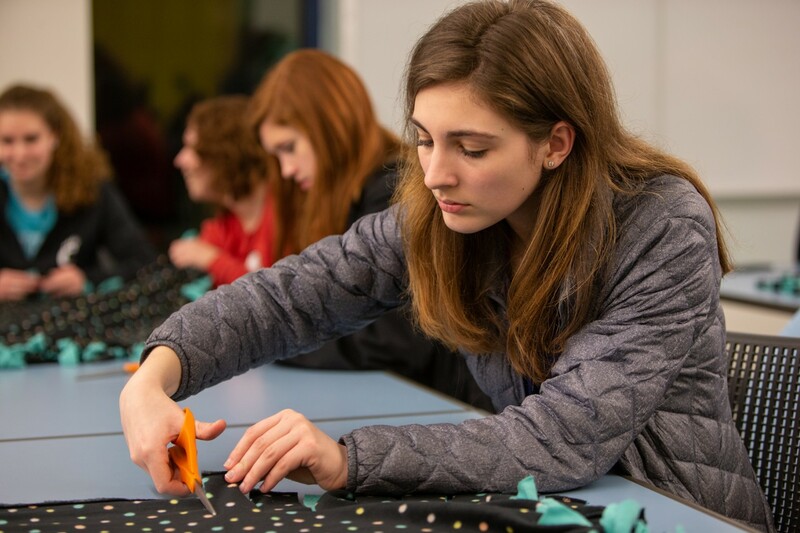 Every year, DAAP hosts several recruitment visits with companies from across the country. Students can learn about co-op and post-graduate employment opportunities while companies can scout for talent. Aaron Bradley and Jason Britton of UC’s Division of Experience-Based Learning and Career Education introduced a unique element to the recent recruitment event after receiving feedback from students hoping to get more out of these company visits. They decided to add a service-based activity for the first time at this event, hoping for greater student engagement. Having worked with St. Joseph Orphanage in the past, Bradley thought they would make the perfect partner. Celebrating its 190th anniversary this year, St. Joseph Orphanage is a comprehensive behavioral health and educational treatment agency that helps children and their families on the road to recovery and success. Founded as an orphanage, the organization has evolved into an innovative agency offering behavioral health services, education and foster care to 4,300 children and families in the region each year. Staff from St. Joseph Orphanage were on hand to discuss the organization and how the night’s efforts would directly impact children in the community.